Create a simple spider pocket to hang on a doorknob or hook – it’s the perfect place to stash a few surprises or treats for your child! • Yarn or ribbon – for lacing & hanging; pipe cleaners make good hangers too. Paint both paper plate halves (bottom side) and let dry. 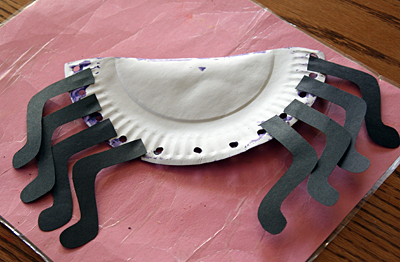 Glue eight legs to the inside of one plate. Don’t cover up your punched holes! Put your plates together, painted sides out. Cut a piece of yarn or ribbon long enough to lace with and use as a hanger. Tie a knot in the first hole, lace all the way around, then tie off where you started, leaving a length of yarn for hanging. Next, add googly eyes and a silly or scary mouth. Now hang it up and wait for treats! My girls love to hang these on their doors and wait for little surprises to appear – candy, stickers, and little notes make it fun. Great idea!! I may have to make some of these up with my son this week. :) :) Thanks for sharing! !